Sebastian Groh is bringing electricity to rural villages in Bangladesh, giving households the ability to buy and sell electricity through his energy trading platform. Sebastian Groh is bringing electricity to rural villages in Bangladesh, giving households the ability to buy and sell electricity through his game-changing, peer-to-peer energy trading platform. His digital, decentralized, and decarbonized solution empowers people to take their energy needs into their own hands. Sebastian's New Idea: Sebastian created a new energy economy by bringing affordable solar electricity to people in Bangladesh, allowing them to buy and sell energy through self-functioning “nano-grids.” By connecting solar home systems in peer-to-peer networks, people can now earn additional income by selling their surplus electricity; at the same time, new users gain access to electricity for the first time in their lives—without a large, centralized grid. Known as “swarm electrification,” each household must acquire a ‘SOLbox,’ which is a direct current, bi-directional power meter that enables peer-to-peer electricity trading, remote monitoring and mobile money payments. Households can choose to be a seller or buyer of the energy produced. The data is stored in the network and payments are processed through a mobile application via credit or debit. By connecting homes with solar systems to homes without electricity, the nanogrid can provide consistent energy for an entire village. A first-of-its-kind, Sebastian’s SOLshare grid concept has been replicated globally and can be applied in any under-electrified area with a minimum of 10 households. SOLshare is expanding its presence in Bangladesh and India and to the rest of Asia—home to the majority of the world’s energy poor, with an estimated 700 million people without access to electricity. 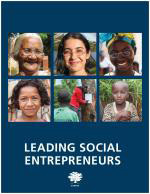 Sebastian' s story appears in the 2018 edition of "Leading Social Entrepreneurs" which features a selection of just a few of the Ashoka Fellows recently brought into the largest global network of social entrepreneurs. The LSE presents some of the newest innovations by leading social entrepreneurs whose ideas are changing the way things are done all over the world.